Add all the sauce ingredients to a small bowl, whisk well and refrigerate until ready for serving. 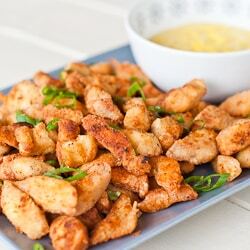 Cut up the chicken breasts into small chicken bite sizes. Heat up oil in a large pot, over medium heat to 375 F degrees. In a large ziploc bag add the flour, sugar, salt, paprika and pepper. Close the bag and shake it so that all ingredients are mixed well. Add the chicken pieces to the ziploc bag, close it and shake it until each piece is fully coated in the flour mixture. Remove the chicken pieces from the ziploc bag, shake all the excess flour from them and place them in a bowl, until ready for frying. Fry the poppers, a few at a time so they don’t get soggy. I divided mine in 3 batches. Fry them for 5 minutes, depending on the size of your pieces, the bigger they are the longer they require. After frying, place them on a plate with paper towels to soak up the extra oil. Serve hot with the mayo/mustard sauce or with hot sauce.